Songbird Essentials Seed Hoop, 30" dia. Keep your lawn free of seed hulls while still feeding plenty of birds by adding this Songbird Essentials 30" Diameter Seed Hoop to your bird feeder. This lightweight and convenient accessory prevents tossed and wasted bird seed, by capturing it when hanging below your feeder. 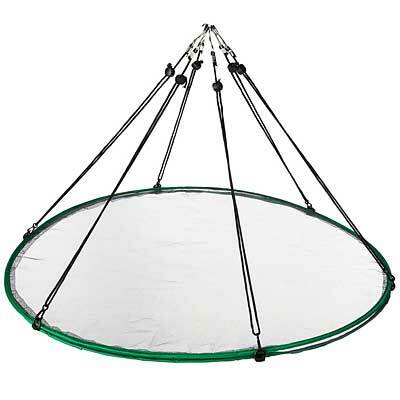 The significant, 30" diameter disc is crafted from tempered steel wire, covered in green, polyester sleeves for weather resistance. Six hooks, evenly spaced around the frame, hold the included nylon cords, and each of these hangers has a squeeze tab to adjust their height. Each also culminates in a metal hook, which attaches to your existing hanging or pole mounted feeder in moments. The vinyl coated mesh easily catches tossed seed, and a raised edge adds depth and acts as a wind guard. The hoop condenses into its included case for seasonal storage, while the green, black, and gray tones offer a classic look. Prevent seed from accumulating beneath your bird feeder with this 30" Diameter Seed Hoop. Songbird Essentials Seed Hoop, 24" dia. Songbird Essentials Seed Hoop, 16" dia.